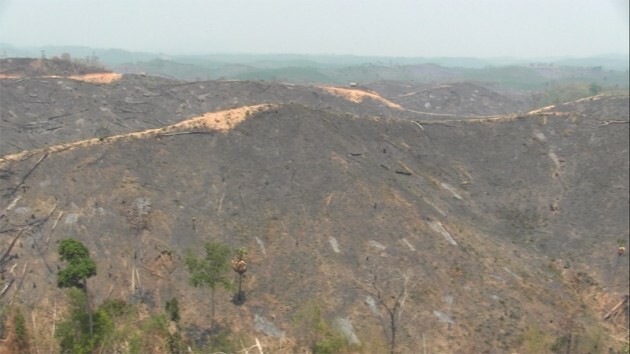 The once forested slopes of the hills around Kyeik Pe Lor village are now surrounded by rubber trees or burnt black in preparation for the planting of more rubber trees. Forests have been burnt to the ground. The burnt land once was part of the villager’s rotation rice farming, but now has been taken over by a company for a rubber plantation project. A Kyeik Pe Lor villager, Mahn No Keh, spoke to Karen News about the effect the rubber plantation has had on local farmers. Kyeik Pe Lor is a Karen community of about 60 families. It is east of Dawei Town, in Tenasserim Division in Southern Burma. The village had been relocated by the Burma Army to a different site, but villagers returned and set up Kyeik Pe Lor village in 2000, after been allowed to by the Burma Army. A Burmese company known to the villagers as Yen Htun Naing or Dawei Nagan (Dragon) Company came to Kyeik Pe Lor village in 2010 and started to clear the land for the rubber plantation. Before 2010 due to the armed conflict between the Karen National Union (KNU) and the Burma military government, the company could not work on the rubber plantation project. Villagers claim that following the KNU and the Burma government’s cease-fire in 2012, the company began to clear the area, destroying almost the entire forest. The local stream dried up and villagers rice farming lands were taken. Mahn No Keh told Karen News. The villagers claim that the company cleared as much as a thousand acres of land around the village. A company official based in Kyeik Pe Lor village, Myo Zin Thant, claimed to Karen News that the cleared land is 450 acres and 150 acres of the land has been planted with rubber trees. The former military regime and the new government has granted and leased land to contract farming projects, such as rubber and palm oil projects, in Tenasserim Division. Many of these areas are around Karen villages and include land that villagers use for farming and the forests that local people conserve. Villagers allege that land confiscation and land grabs were common under the former military regime, but in recent months incidents have escalated. Saw Ka Ko told Karen News. The villagers said that at first they tried to protest to the company, but were forced to accept that they had lost their land. Saw Moe Win, the village secretary told Karen News. The villagers allege that despite their initial refusal to give up their land, a former village pastor, Thera Kya Thein, forced the villagers to accept it. The villagers also allege that the company has an understanding with the local KNU military leaders to proceed with their project. Karen News has spoken to the pastor, Thera Kya Thein, who said that some villagers as well as the [local] KNU leaders granted permission for the company to go ahead with their plantation project, otherwise the company could not have been able to carry out the project. Thera Kya Thein refused to name those involved. Karen News contacted the KNU’s Kar Ser Doh Township officials responsible for the area who said that they have not given permission to the company and that they were not aware of the land grab issues.